Inta Audio's i5 system offers high performance and very low acoustic noise levels at a competitive price. Inta Audio were founded way back in 2000 with the aim of building ultra-quiet digital audio workstations, and since then have built up an enviable customer base and reputation. Judging by the reviews of their various PCs in SOS, it's not hard to see why, as they consistently manage to include little twists in their designs. For instance, they offered SOS our first ever AMD‑based PC, which also turned out to be one of the quietest systems I'd heard at that time. When I received the machine under review here, I could immediately see that Inta Audio hadn't lost their touch. Not only had they been quick off the mark in using one of Intel's new Core i5 Lynnfield processors, which promise most of the power of the i7 series at significantly lower cost, but this system also included three eco‑friendly 'green' hard drives, a Blu‑ray Disc rewriter supporting media of up to 25GB capacity, and a most intriguing four‑way Intelligent Fan Controller designed to continuously adjust fan speed for minimum acoustic noise. The combination of lots of processing power, easier backup, lower running costs and ultra‑quiet acoustic noise should be Nirvana for the musician, so let's see how close this system gets. With the exception of one Firewire port and two USB 2.0 ports found on top of the case, all of the i5 system's connections are made on the back panel. 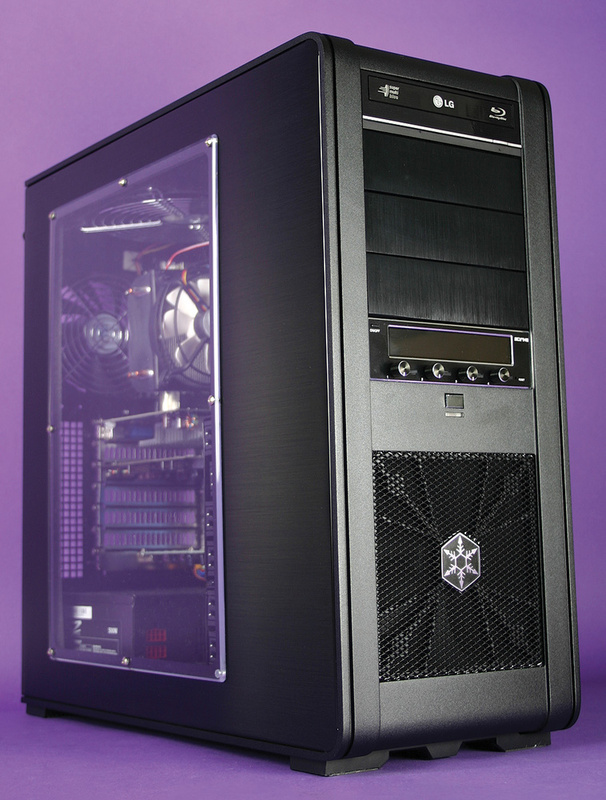 Silverstone cases are popular among DAW builders, and it's not hard to see why. This black aluminium Fortress model, with its smooth, clean lines, curved front edges and blue displays, looks gorgeously hi‑tech, and has a handy top‑mounted pod with one Firewire and two USB 2.0 ports for your dongles and external audio interfaces. The review model featured a transparent perspex window on one side displaying the interior 'works' in all their glory. This perspex panel also helps to dampen case vibrations, but a black version will be available for those who are easily distracted by the sight of spinning fans and flashing lights. 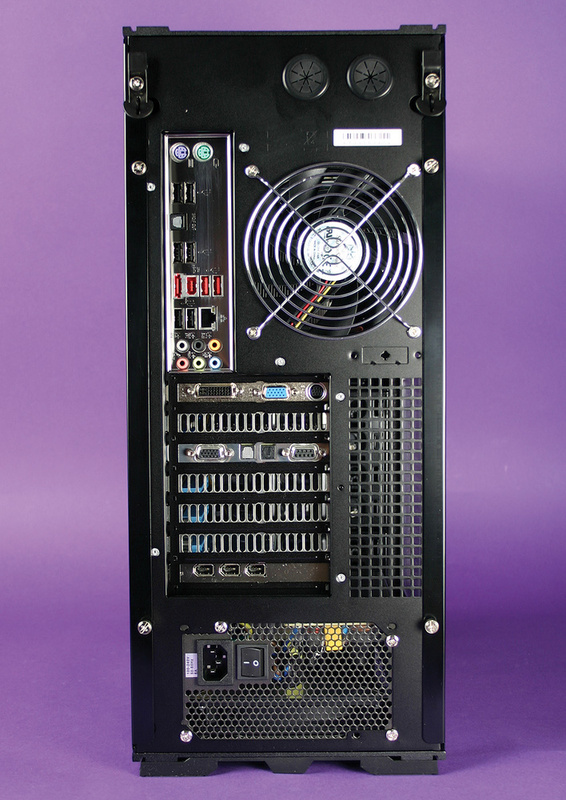 In the front-panel drive bays of the review PC were housed a Blu‑ray optical drive, capable of writing a 25GB BD‑R SL disc in under 15 minutes, and therefore a wonderful backup option for musicians, and a Scythe four‑way fan controller. The latter is in charge of three case fans: a 140mm model at the front keeping the hard drives cool, a second 140mm model at the top for extra CPU cooling, and the third 120mm unit at the rear for overall case temperature. The controller provides read-outs of each fan speed and the results from the three associated temperature sensors, which can be reassuring on very hot days! Inside, the wiring was a model of neatness (a good thing, considering that it's on show through the window), with an Intel i5 750 2.66GHz Quad Core CPU the star of the show, mounted on an Asus P7P55D motherboard offering plenty of expansion-slot potential. A Texas Instruments Firewire PCI expansion card had been fitted to provide three more FW400 ports in addition to the two VIA ones on the motherboard, while one of the PCIe x16 slots was filled by an Nvidia 9400GT 512MB passively cooled graphics card. Unfortunately, the latter's heat sink obscured an adjacent PCIe slot, but Inta Audio can supply a slimmer alternative for those who need maximum expansion potential. 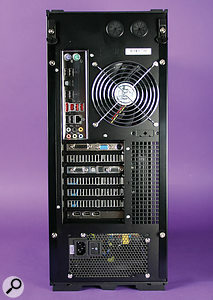 Nevertheless, two empty PCI and two PCIe slots were still available. The three Western Digital 'Green' hard drives (500GB for system duties, and 1000GB each for audio and samples) typically consume around five watts less power than standard desktop models (every little helps). They also generate lower temperatures and acoustic noise levels, which means they really don't need the extra expense of being fitted in drive sleeves or cradles. For the review PC, Inta Audio had created a special dual‑boot setup, comprising the Windows XP Pro 32‑bit operating system (their normal specification, along with 4GB of Corsair RAM), and Windows 7 64‑bit alongside for comparative purposes. Of course, the main reason for 'going 64‑bit' is being able to access more RAM, so they'd also increased the RAM on this particular machine to 8GB, and had fitted an RME HDSPe AIO (All In One) PCIe audio interface for testing purposes. 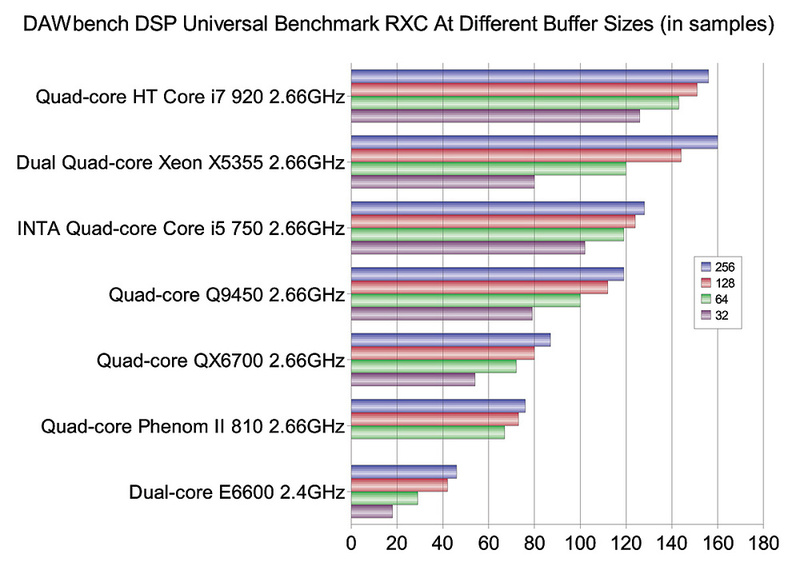 When running a test based on Reaper Reaxcomp (RXC) plug‑ins, the Core i5 750 beats most other processors running at the same clock speed, except for the significantly more expensive Core i7 and dual-processor Xeon systems, and is second only to the Core i7 when it comes to low-latency performance. I was expecting low noise from this machine, but even I was surprised by the near silence I heard after powering up, since when this PC is idling, none of the three case fans needed to revolve at all. With only the CPU fan spinning, the system continued to stay at a comfortable 43 degrees Centigrade, and then as I applied my 100 percent stress tests the other three fans sped up gently and smoothly, as the temperature rose to a maximum and still very safe 65 degrees Centigrade and exhibited a noise level similar to other quiet systems. However, within a few seconds of removing the stress test, the fans slowed right down or stopped altogether, so when the music stops and your loudspeakers are silent, this PC will be too. The most impressive thing about this controller compared with some is that the fan speeds change only when needed, and then only in a gentle and gradual manner, rather than the sudden roar you sometimes experience with others as fans cut in and out. You can adjust temperature thresholds and fan speeds on the controller by hand, although I found no need to do this, since Inta Audio had set excellent defaults. The Windows setup was exemplary, with all the recommended tweaks for optimum audio performance, and the biggest difference between the 32‑bit and 64‑bit operating systems was available RAM: the BIOS declared that 8184MB was installed, and Windows 7 64‑bit also found and was able to use all 8GB, while Windows XP 32‑bit could only use 2.99GB, due to memory mapping of various hardware devices inside the 4GB limit. The hard drives managed an excellent 100MB/second sustained transfer rate, making them theoretically capable of running perhaps 200 simultaneous tracks of 24‑bit/96kHz audio. Meanwhile, Sisoftware's Sandra measured 16.5GB/second Memory Bandwidth (exactly the same as that of the Scan Core i7 PC with identical clock speed reviewed in the February 20009 issue of SOS), CPU Arithmetic of 63GIPS (Dhrystone) and 36GFLOPS (Whetstone), and CPU Multimedia of 100 MPixels/s (Integer) and 62 MPixels/s (Float). Intel's Core i5 series (discussed in PC Notes in the November 2009 SOS) reverts from tri‑channel to dual‑channel RAM and dispenses with Hyper Threading, although the latter is compensated for by its new Turbo Boost technology, which ramps up the clock speed depending on how many cores are being used by the software. Fortunately, most audio software can get the best out of all four 2.66GHz cores simultaneously, but with other software that only utilises one or two cores, the clock speed can be automatically increased as far as 3.2GHz, while unused cores are shut down to save power. Most importantly for the musician, I carried out tests with this clock speed ramping up and down, and detected no audible clicks or other interruptions during the process. As usual, for me the acid test of any music PC's performance is the DAWbench Universal DSP benchmark, with its representative selection of audio tracks and plug‑ins, and I managed 124 Reaxcomp plug‑ins at a buffer size of 128 samples (3ms latency at 44.1kHz), and 119 at 64 samples. As you can see from the graph, this places Inta Audio's Core i5 machine just 18 percent slower than the significantly more expensive Core i7 processor running at the same clock speed. Just as importantly, the Core i5 exhibits the same family trait of beating all other processors at lower latencies by a considerable margin, managing an impressive 20 percent advantage over Intel's similarly clocked quad‑core Q9450 at 32 samples! I very grateful to Inta Audio for providing me with the option of running Cubase 5 64‑bit under Windows 7 64‑bit, but my DAWbench Universal DSP playback suffered from a cyclic audio glitch every 10 seconds or so that made it difficult to accurately establish the maximum number of simultaneous Reaxcomp plug‑ins. I managed about 113 instances of the Reaxcomp plug‑in with a 256‑sample buffer, compared with 128 for the 32‑bit result, but since this also includes the extra overhead of 113 instances of the 'Bitbridge' utility required to run the 32‑bit Reaxcomp plug‑ins inside their 64‑bit host, I suspect that the true results are roughly on a par. 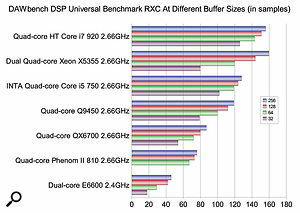 Just as Intel's Core i7 series set a new benchmark for low-latency audio performance, judging by this Inta Audio PC its Core i5 series now looks set to become a favourite for those on a tighter budget, and a considerably better alternative to other quad‑core processors from both AMD and Intel if you want to run with latencies of 3ms or lower. Moreover, Inta Audio have created a very stylish‑looking system, with Blu‑ray for backup, plenty of spare slots and ports, and an acoustic noise level even lower than most of the other computers that I've tested to date. Being almost silent when idling, it's an ideal choice for anyone recording in the same room, while its fantastic low‑latency performance also makes it an excellent candidate for 'real time' monitoring during those recordings. Overall, the Inta Audio Intel i5 Pro Music PC is an extremely impressive package that will undoubtedly prove to be very popular with musicians. As you might expect, plenty of DAW builders are keen to supply PCs based around Intel's cheaper Core i5 processor, but few had models advertised as we went to press. Those that did include ADK Pro Audio (www.adkproaudio.com) as part of their Core Pro range, the DARC Studio range from Direct Resolution (www.directresolutions.co.uk), the Nimbus Project Studio Core from Rain Recording (www.rainrecording.co.uk), and Scan's 3XS P55 Lite DAW (http://3xs.scan.co.uk). 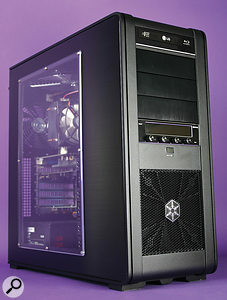 Case: Silverstone Fortress FT01 mid‑tower. PSU: OCZ MOD Extreme Pro 500W Ultra Quiet. Motherboard: Asus P7P55D, featuring Intel P55 Express chip set, one LGA1156 socket for Intel Core i7 or i5 processor, four 240‑pin DDR3 DIMM sockets supporting up to 16GB RAM, two PCIe x16, two PCIe x1, and three PCI expansion slots, six SATA 3.0 ports, up to 14 USB 2.0 ports, and two IEEE1394 ports with Via controller. Processor: Intel i5 750 2.66GHz Quad Core CPU with Intel Turbo Boost Technology (up to 3.2GHz), 45nm, 8MB Cache. Cooling: Arctic Cooling CPU Freezer 7 V2 Heatpipe, Scythe four‑way fan controller. System RAM: Corsair 4GB DDR3 1600MHz. Hard drives: 500GB system drive, 1000GB audio drive and 1000GB sample drive, all Western Digital Caviar Green, SATA 3, 32MB cache. Graphics card: Nvidia 9400GT dual head 512MB, with VGA and DVI‑D outputs. Firewire Card: three six‑pin FW400 ports with Texas Instruments chip set. Optical drive: LG BH08 8x Blu-ray 25GB, also supporting DVD and CD formats. Installed Operating System: Windows XP Professional 32‑bit with Service Pack 3. All Inta Audio PCs now include a full, licensed copy of Novation's Producer Pack comprising V-Station, Bass Station and FX Plug‑in Suite worth £150, Acronis True Image Home 2009 backup software, and the handy Studio Buddy utility. The customer's software and soundcard can also be installed free of charge. The PCs are covered by Inta's Standard Care Plan, which includes one year's back‑to‑base parts warranty, labour costs only during the second and third years, and a full three years of email and telephone support. The £39.99 Essential Care Plan extends the parts warranty to three years, and the £99 Premium Care Plan in addition provides three years collect and return of your computer, and lifetime telephone and email support. Remote Support is also available via broadband Internet connection, so a technician can remotely connect to your computer to help diagnose possible problems. Intelligent fan controller system results in a very low acoustic noise level indeed. There are plenty of spare expansion slots if you need them. 25GB Blu‑ray drive is ideal for backup purposes. Up to five Firewire 400 ports available. The stylish case, quiet PSU, and fan controller do bump up the price a bit, but are necessary if you want an almost silent system. The Inta Audio i5 Pro Music PC is impressively powerful yet almost silent most of the time — a wonderful combination for the musician! Inta Audio Intel i5 Pro Music PC with Windows XP Pro/4GB RAM, £1199. As reviewed, with Windows 7 Pro 64‑bit and 8GB RAM, £1388. Prices include VAT. Inta Audio +44 (0)845 299 4242. Inta Audio Intel i5 Pro Music PC with Windows XP Pro/4GB RAM £1199. As reviewed, with Windows 7 Pro 64‑bit and 8GB RAM, £1388. International customers order direct from Inta Audio in the UK.